Not a big fan of Spam myself, I was more than skeptical about Spam musubi, but I’d seen it on so many travel food shows that I knew I had to try it. 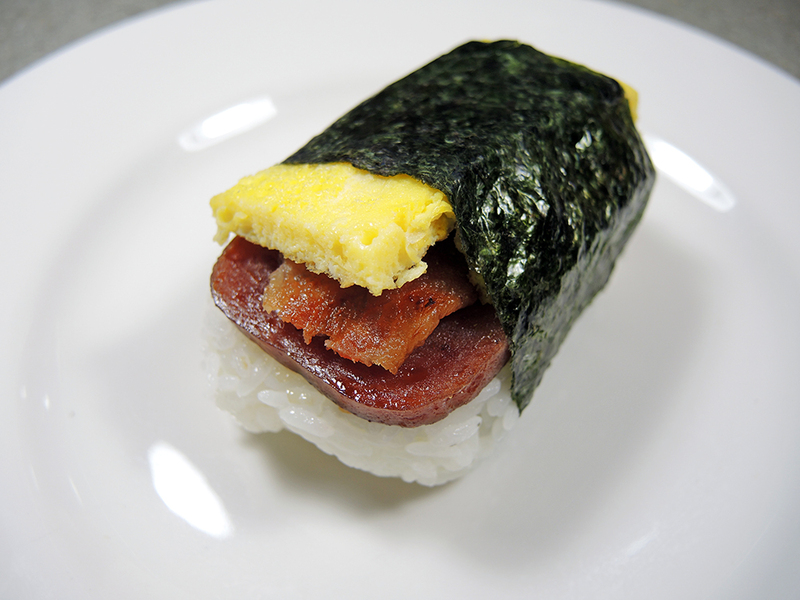 Luckily, the first Spam musubi I tried was from a place that turned musubi from a weird breakfast snack into an art form. 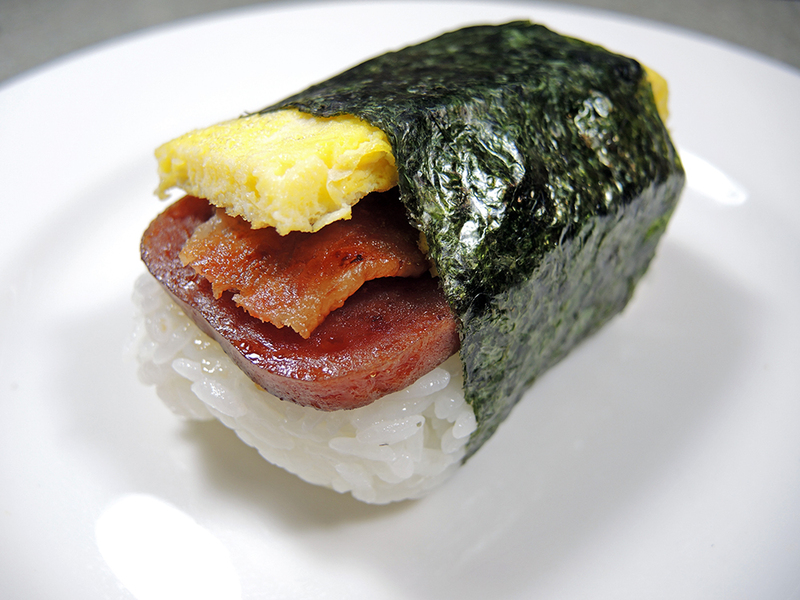 They marinated the Spam in a teriyaki sauce and topped it with egg and bacon to create the ultimate breakfast Spam musubi experience. 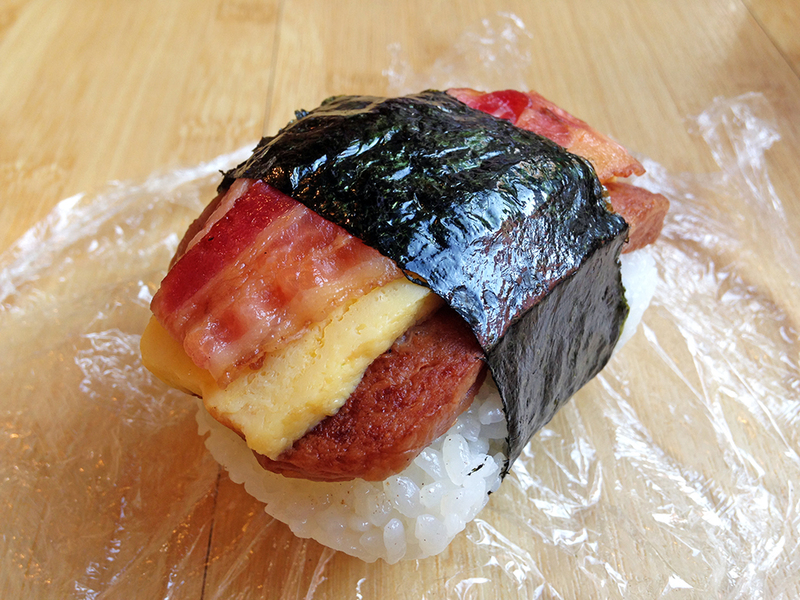 Unlike much of the sushi served in the U.S., this Spam musubi is served warm. I don’t know what else to say except that this combination just works. 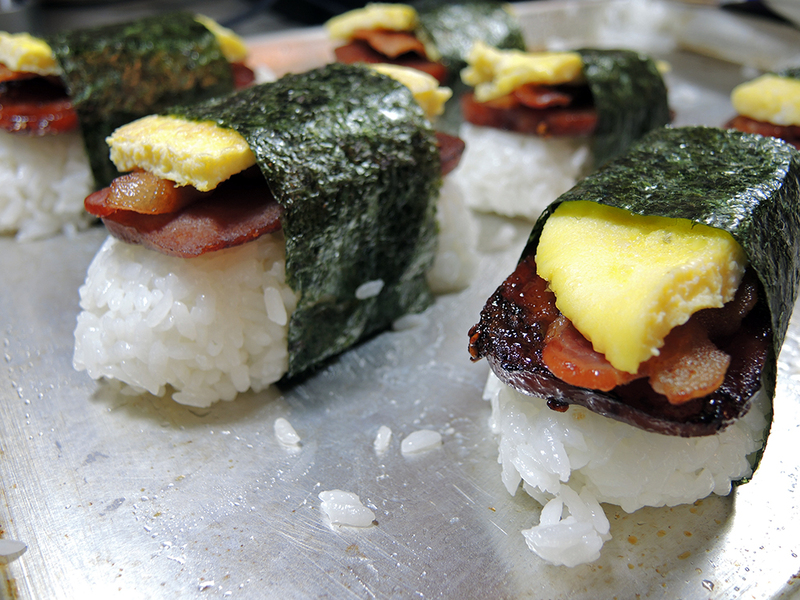 This isn’t the usual convenience store style Spam musubi with Furikake that some love and many hate. This is the ultimate in hand-crafted musubis. I probably ate five of these during my week-long stay in Hawaii and when I came back home to the Northeast, I knew I had to try and recreate my experience at home. My wife bought me a joke gift of a cheap musubi press, which you can use to make a uniform pressed musubi, but I’m personally partial to this hand-formed method. Makes 6 servings at 232 calories each. 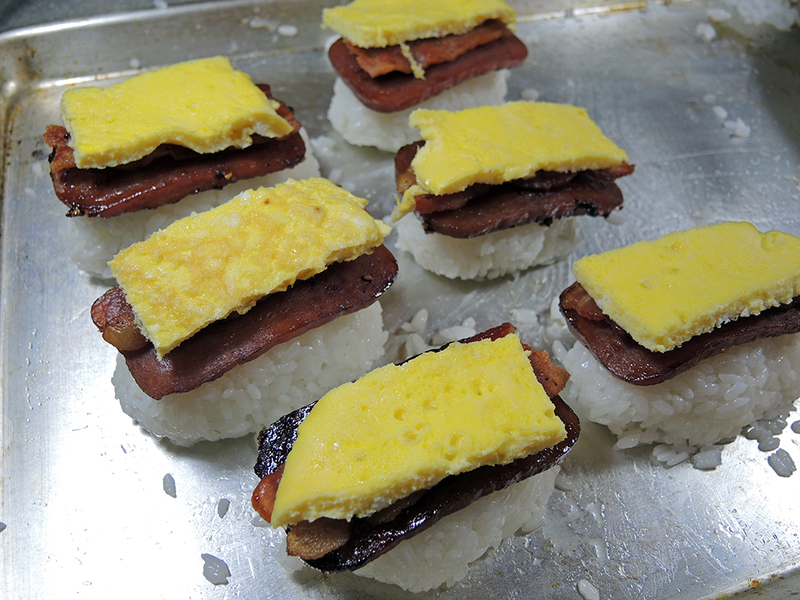 Breakfast SPAM Musubi marinated with teriyaki sauce then topped with bacon and egg. Small amount of butter or oil to grease the bottom of a pan. 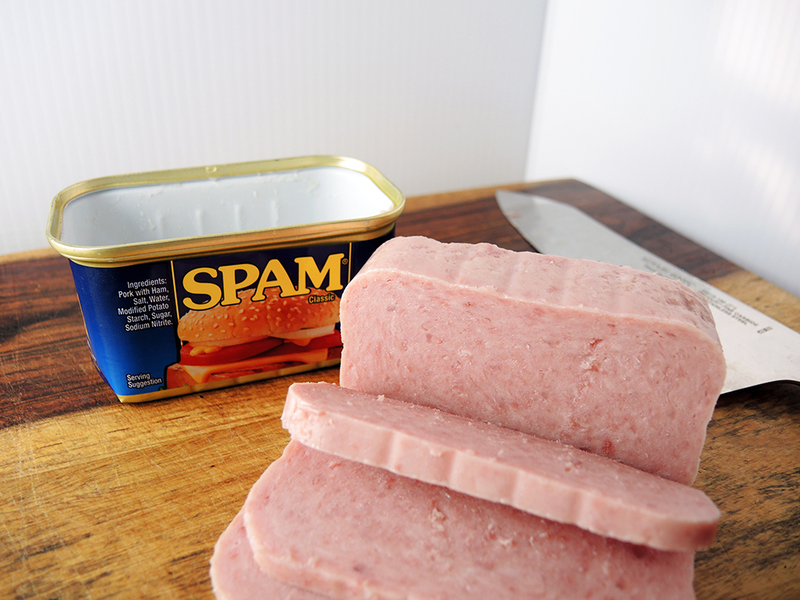 Slice up the block of Spam into 6 equal pieces. I know it looks kind of gross, but it will all be worth it! 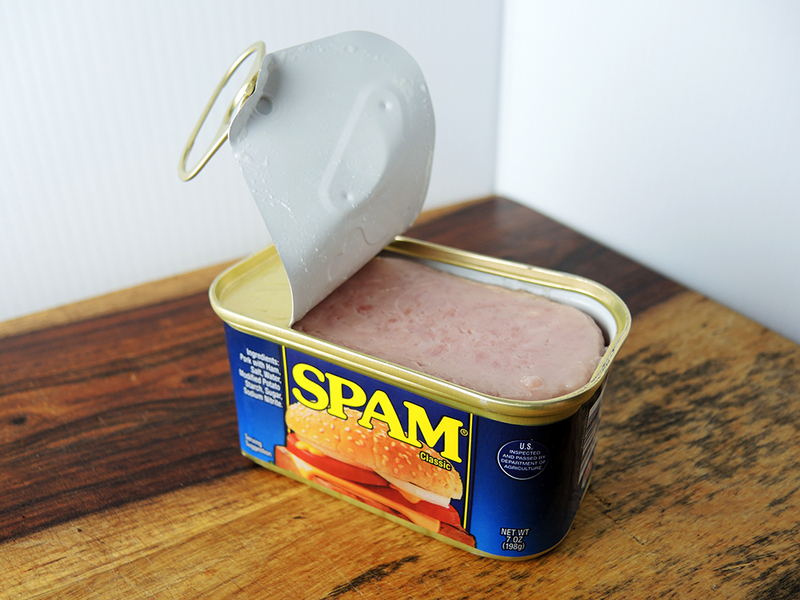 Place the Spam into an airtight container and then cover the spam with your favorite Teriyaki marinade (I enjoy Soy Vay’s Veri Veri Teriyaki, or stay tuned for my own teriyaki recipe). Let it marinate covered in the fridge overnight or up two days. 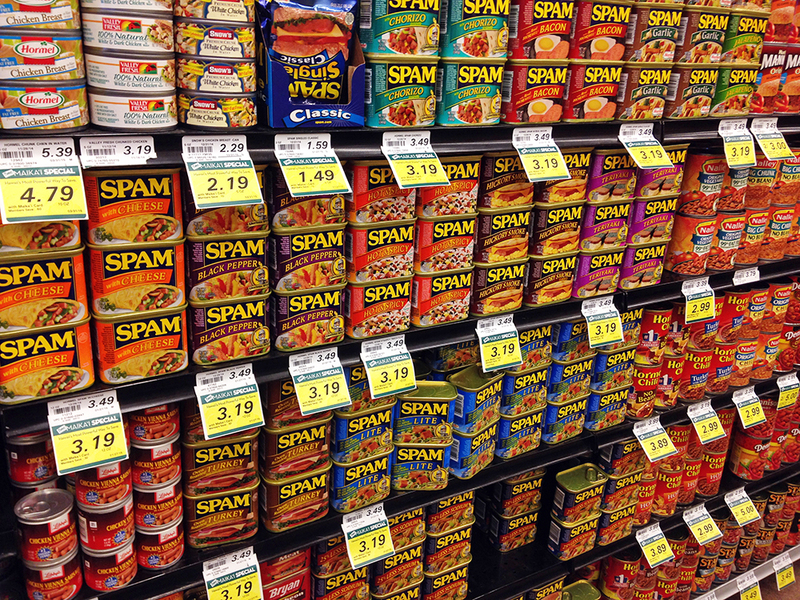 If you let it marinate for too long, the Spam can start to harden and dry out a bit. It’s still edible, but you’ll lose some of the texture. 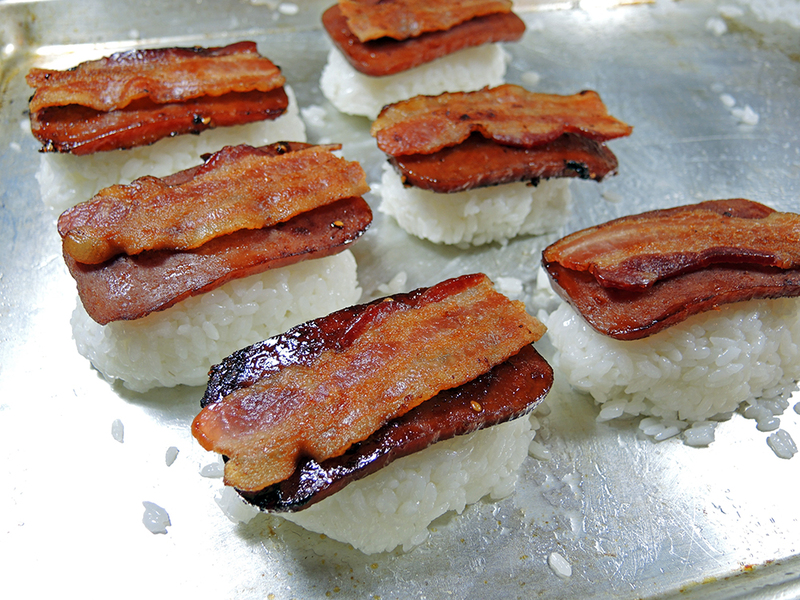 After letting the Spam marinate, and you’re ready to start making musubi, get your rice cooking. 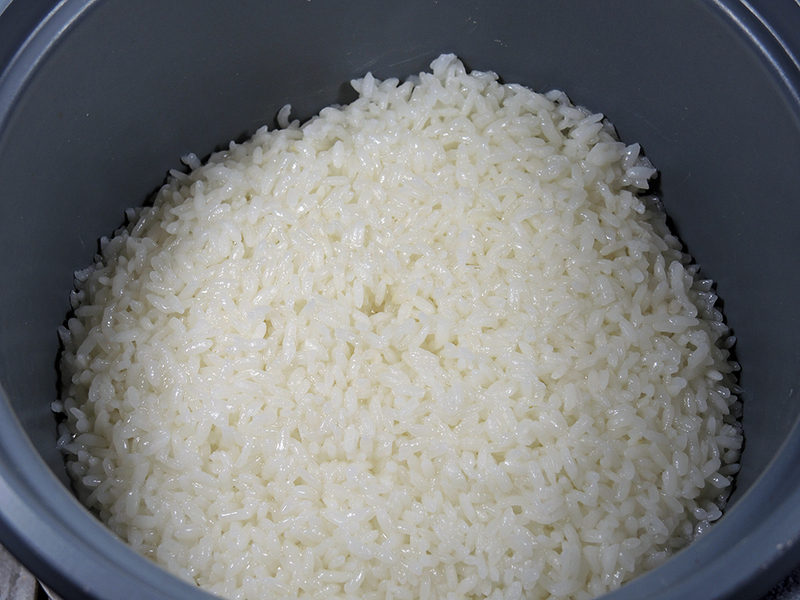 1.5 cups of sushi rice to 2 cups of water in a rice cooker should do it. Otherwise, follow the instructions that come with your sushi rice. While the rice cooks, put the vinegar, sugar, and salt into a small sauce pot and bring the liquid to a simmer, stirring occasionally. You don’t need to let the ingredients boil because you just want the sugar and salt to dissolve. Once they’ve dissolved, remove the pot from the heat and set aside. Be sure not to place your face over the sauce pot because the smell will likely cause you to cough (I learned the hard way!). Once the rice is done (after 15 minutes or so), dump the rice out onto a large baking sheet and spread it out to cool it quickly. This keeps the rice from over-cooking and keeps the integrity of the individual grains. Let the rice cool for 15 – 20 minutes. 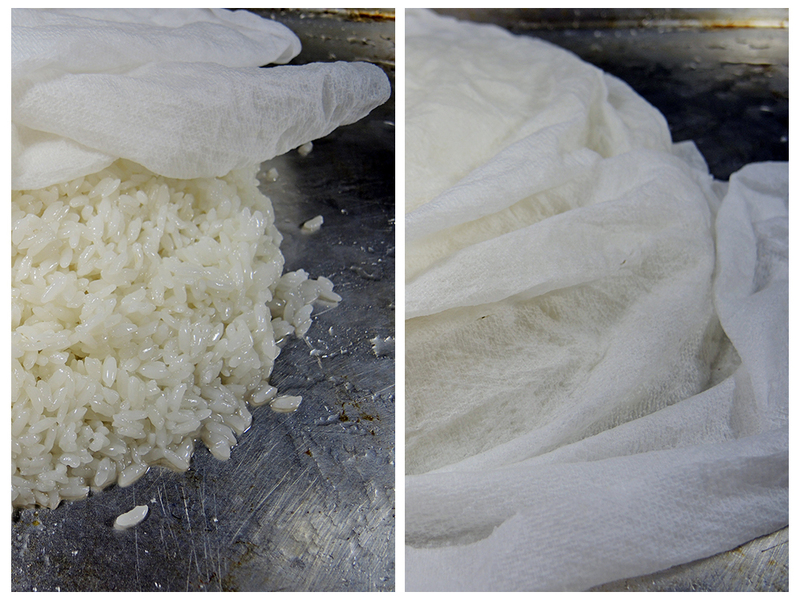 When the rice and the vinegar mixture have cooled, use a spoon or ladle to drizzle the vinegar all over the rice. Coat all of the rice and it’s ok if you leave a little bit of vinegar mixture in the pot if it seems like the rice is saturated enough. Mix the rice together thoroughly and then form it into a sphere or square before covering with a damp clean kitchen towel or damp paper towel to keep it from drying out. Set the rice aside and get started cooking the bacon. Set three slices of bacon onto a large frying pan set to medium-low heat. Cook the bacon on this low heat to make sure they the strips stay flat and not overly crispy. Flip them as needed. 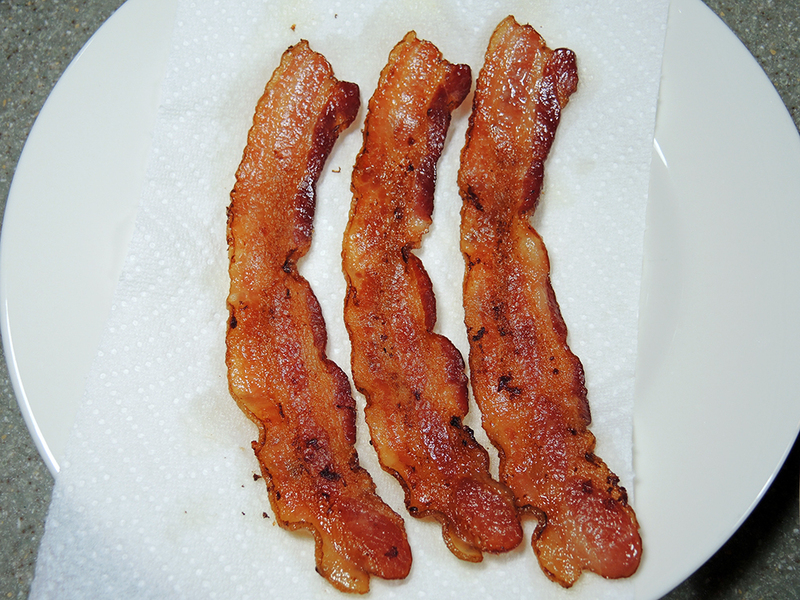 Once the bacon is done, set the pieces aside on a paper towel to absorb the excess grease. The bacon should be crispy yet malleable and defibnitely it shouldn’t shatter. Using the same large pan, dump out most of the bacon grease and all of the burned bits, but leave a little grease in the pan. 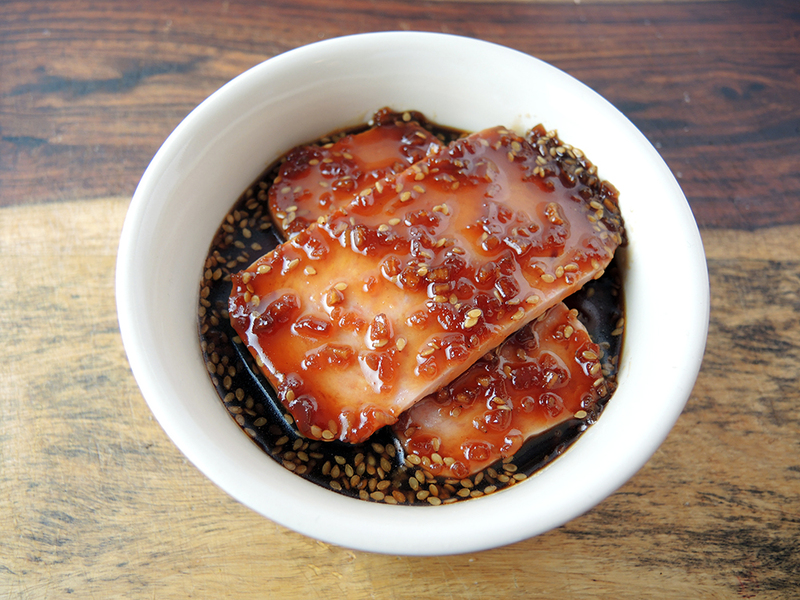 Take the Spam out of the teriyaki marinade and wipe off the excess sauce using either a paper towel or simply rinse of the Spam quickly under running water. I know that sounds weird, but it works. 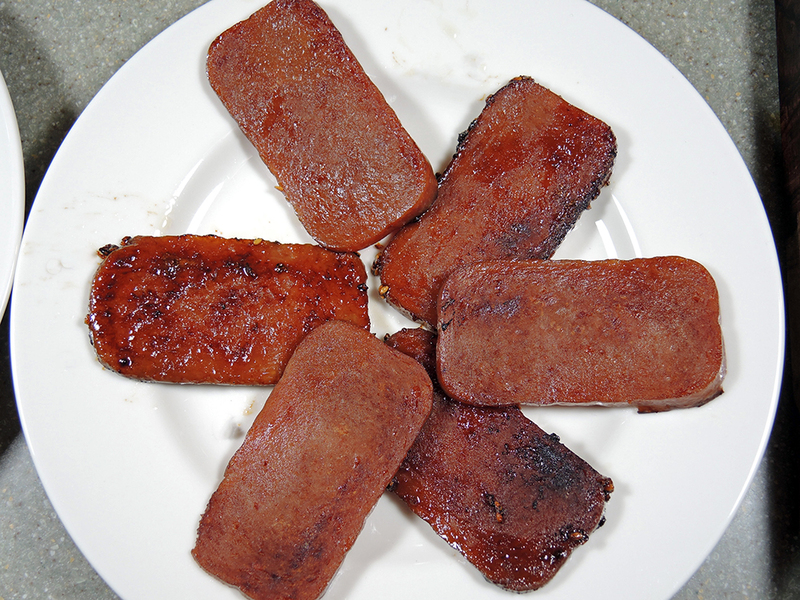 You don’t want the excess sauce to burn when you are pan frying the Spam. 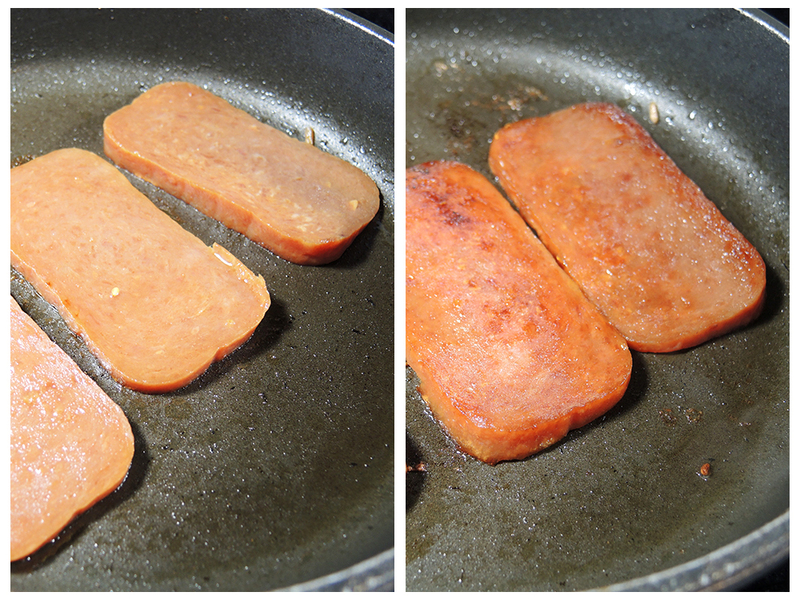 Place the Spam in the pan that previously held the bacon and pan sear each side on medium-high heat until each side is a deep brown, but not burned. Once all of the Spam has been seared, set the pieces aside on a covered plate (you can use plastic wrap or a pot lid) so that you can start on the eggs. 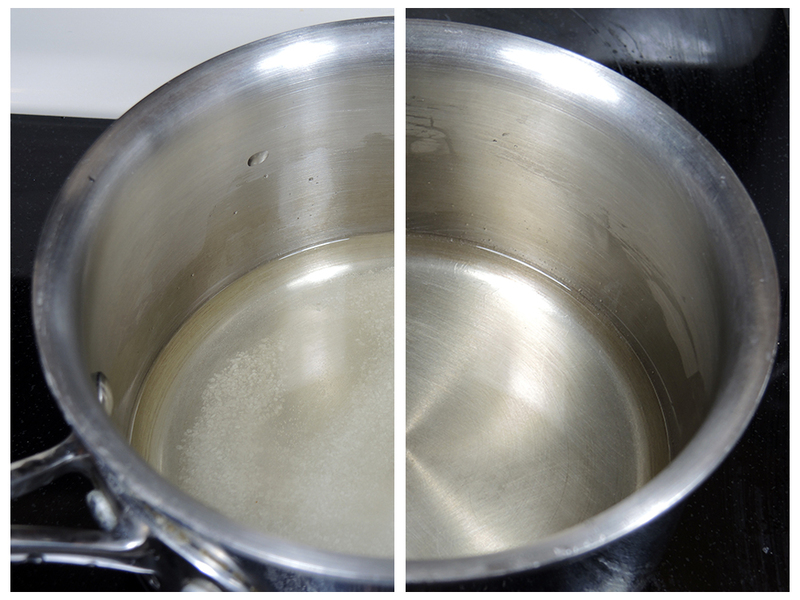 Grease a small pan (if you have a square or rectangular pan, then use that!) with some butter, oil, or even some leftover bacon grease, and set it on the stove to medium-low heat. 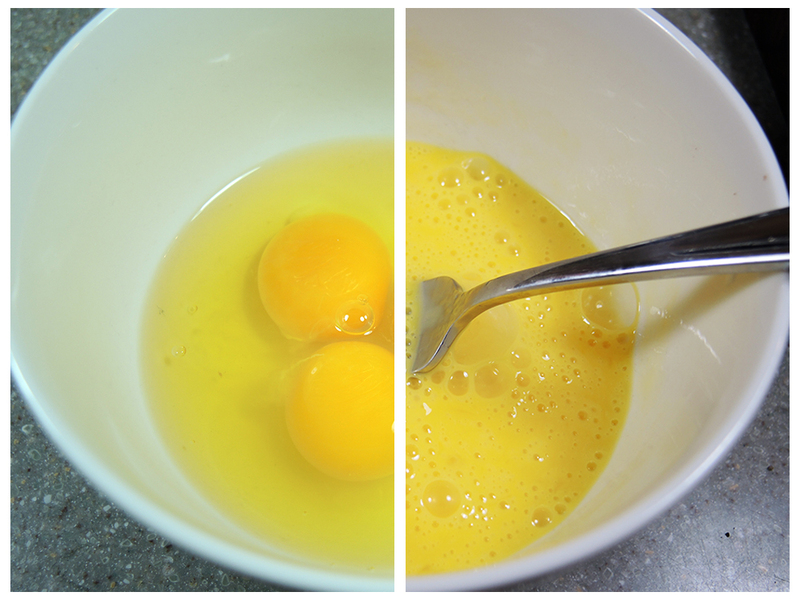 In a small bowl, crack three eggs and whisk them together vigorously using a fork. 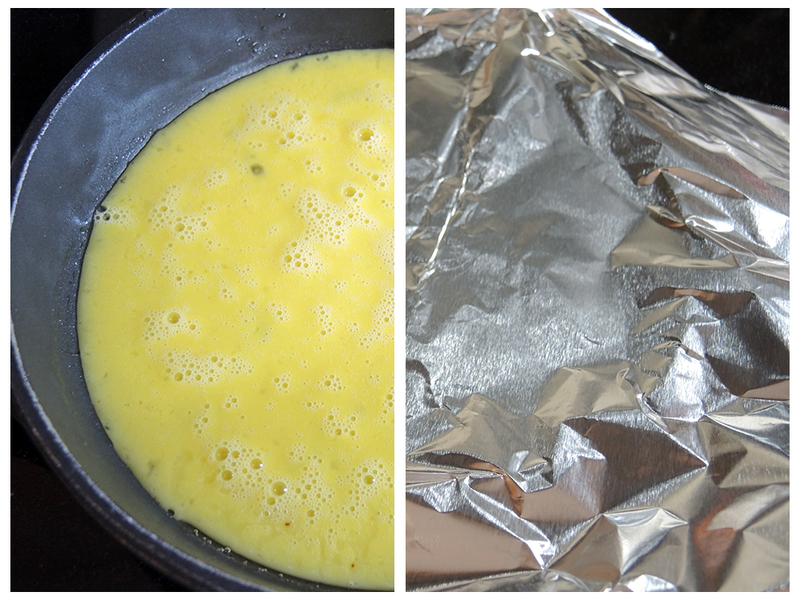 Pour the eggs into the small pan and cover with a lid or aluminum foil. Covering the eggs makes them puffy through a little bit of steaming and gives them a weird yet light and airy texture. Let the eggs cook covered for a few minutes. After 4 minutes or so, check on them to see if they are fully cooked and add a pinch of salt and pepper. If not cooked yet, and you’re worried about the bottom getting over-cooked, you can try and flip the eggs using a broad spatula at your own risk. If the heat is low and you keep the eggs covered, they should cook through. 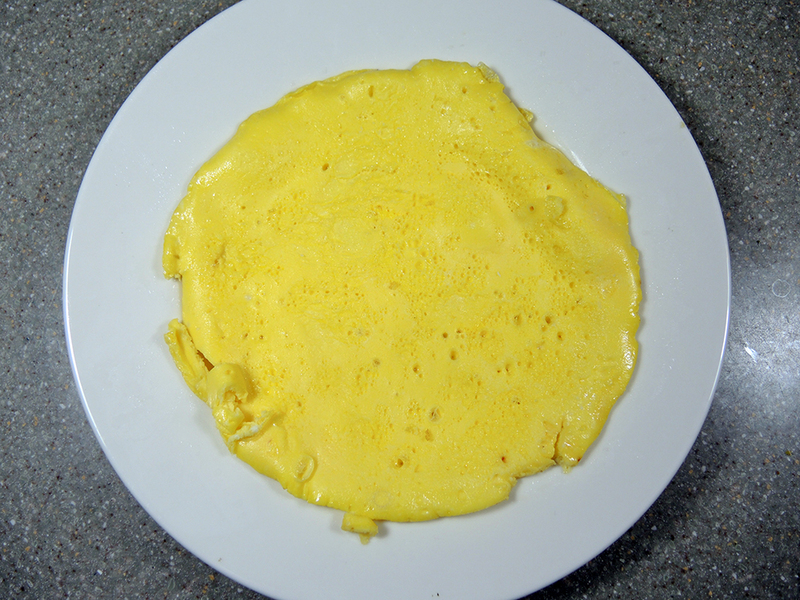 When done, slide the eggs over onto a plate and let them cool. Go back to the baking tray that previously held the rice and start splitting the rice apart into six equal batches. 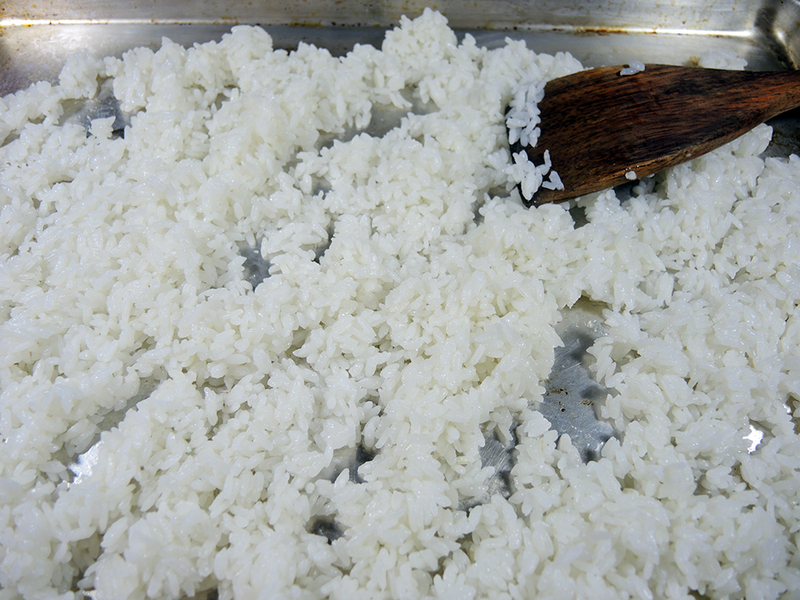 You can use your hands as long as you wet them with cold water to keep the glutinous rice from sticking too much. Form the six batches into tightly packed mounds, wetting your hands as necessary. 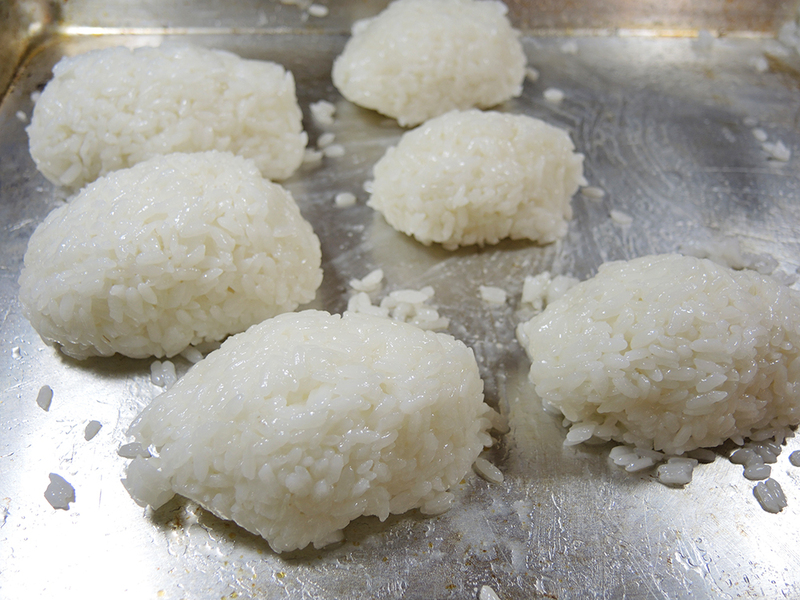 Carefully place a piece of Spam over each mound of rice. Then cut the bacon strips in half so that you have six pieces of bacon to lay over the Spam. Cut the eggs into six pieces. If you used a square pan this should be easy. If you used a round pan, like me, then you can do a little but of trimming to get six almost equal pieces of eggs that are about the width of the bacon strips. Lay them over the bacon. Next, get the Nori sheets and if you have “half-sheets” already, just cut them in half to create six strips. If you have full sheets, cut them into thirds to make six strips. 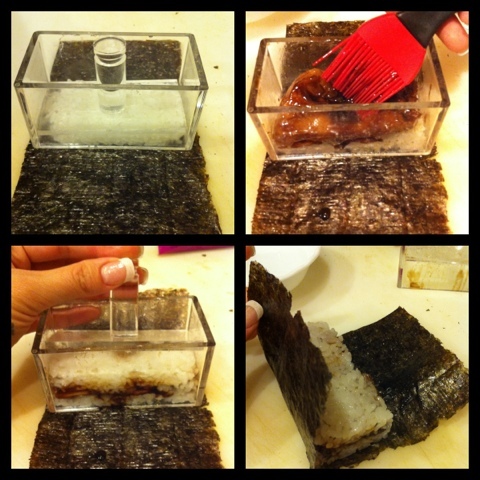 Carefully, lift each musubi and wrap a strip of nori around it so that the ends meet on the bottom of the musubi. The reason you want to do it this way is that if the nori doesn’t quite reach around the musubi or if the musubi bursts through the nori, then it happens on the bottom and the musubi still looks good on top! 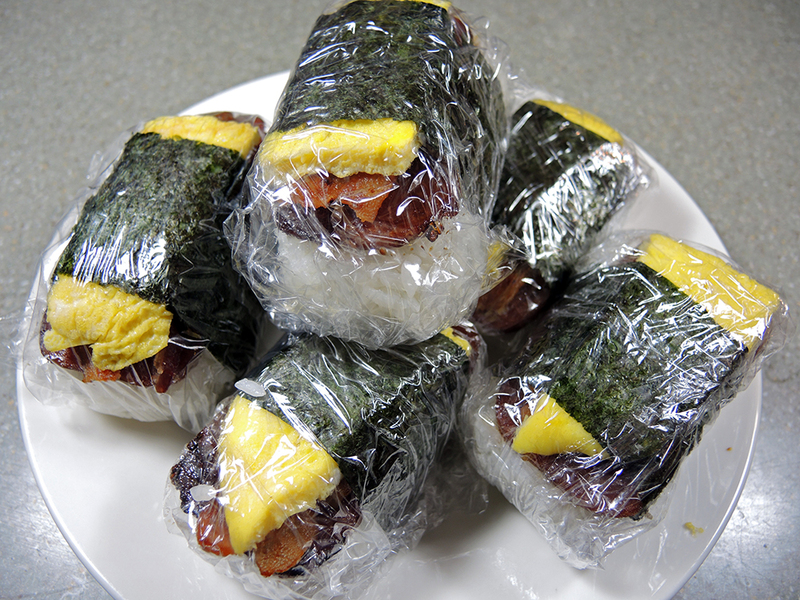 After wrapping each of the six pieces, you now have musubi! Congratulations! You can eat them right away while they are warm, but I personally think that wrapping each musubi in plastic wrap before serving, helps the flavors to really meld together and also retains moisture. You can also store them in the fridge for a couple of days. When you’re ready to have leftovers, simply put a plastic wrapped musubi in the microwave for 30 – 45 seconds. It’s possible that they are even better the next day. I personally like spam. This recipe sounds very interesting even though it has many steps. Also where can I get the Nori sheets?